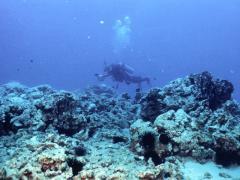 After having made only four dives last week at our dive site (and none in the mornings) we were eager to return "home." 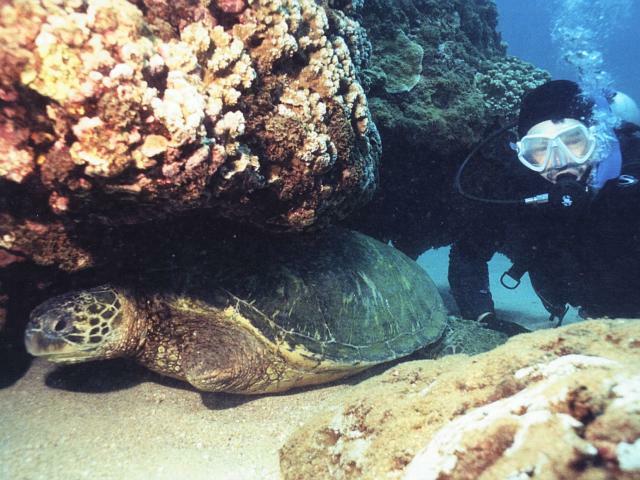 As a result, we made only one dive at Kuamo'o and we limited this to a survey tour videotaping as many turtle faces as we could. 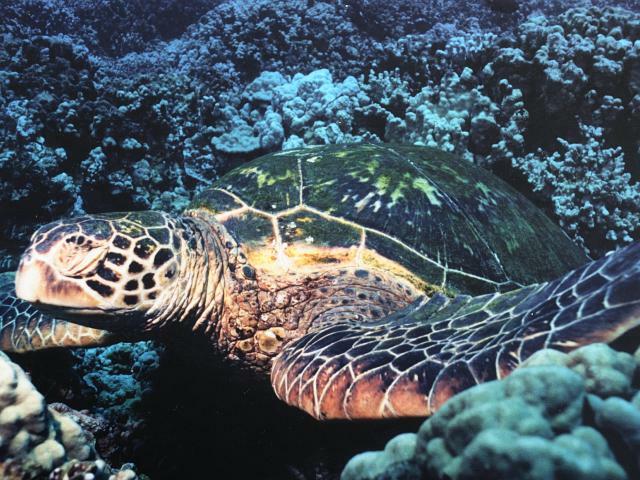 Being invited to document Kuamo'o is a true privilege as well as an unprecedented opportunity to compare our Honokowai ohana with the turtles in this Napili area. Kuamo'o is like Time Travel. 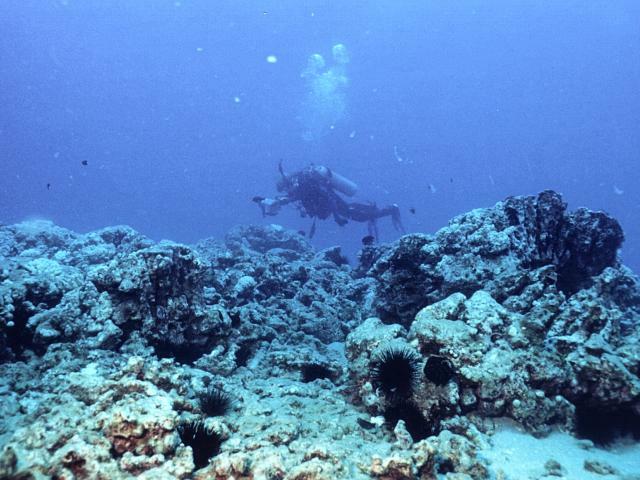 The fibropapilloma (FP) prevalence and severity remind us of our own dive site back in the early 90s. The fibropapilloma (FP) prevalence and severity remind us of our own dive site back in the early 90s. We don't understand why our dive site is now blessed mostly with regression cases while the Kuamo'o complex still has the FP "fire" raging. All we can do is be grateful that the honu we love fared as well as they did, and hope the new Kaumo'o ohana will ultimately triumph too. The return this week to our normal schedule (exercise, writing our book, diving, etc.) felt good. We could once again concentrate on trying to find answers to what's happening out there. It is indeed puzzling. The most remarkable and mystifying change of all is the complete abandonment of the turtles of The Turtle House. The Turtle House is the very one that Osha Gray Davidson writes about in his book, Fire in the Turtle House. 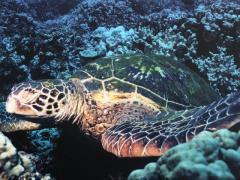 After years of honu being there, whenever we visited this summer, the most we've seen has been one turtle. Most visits there were none. 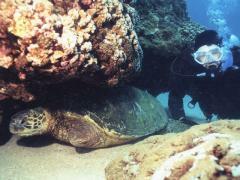 The Turtle House and its vicinity, The Rock and The Rest Site, are virtually abandoned. "Only creatures who are on their way ever poison their own well." Instead of turtles, the "well" is now populated--perhaps even over-populated--by two species of sea urchins, and far too much brown scum slime. Where once corals thrived there's just algae-coated rubble. Early this week, we were startled to discover the return of Lyngbya majuscula in what threatened to be bloom proportions. Light brown baby peach-fuzz Lyngbya hairs invaded the sand bottom throughout our site. More robust Lyngbya plants anchored themselves to Halimeda and other limu. Things were indeed browning up. All about, littering the sand and forage, were tiny sea hares once again. Photographing rivers and rain of sea hares. By the end of this week, these creatures had once again begun to form rivers and float up in the current in a sea hare "rain." We'd seen this in early July. Then the Lyngbya and hares disappeared. Now, late in August, they're back. BOOM. Bust. BOOM. 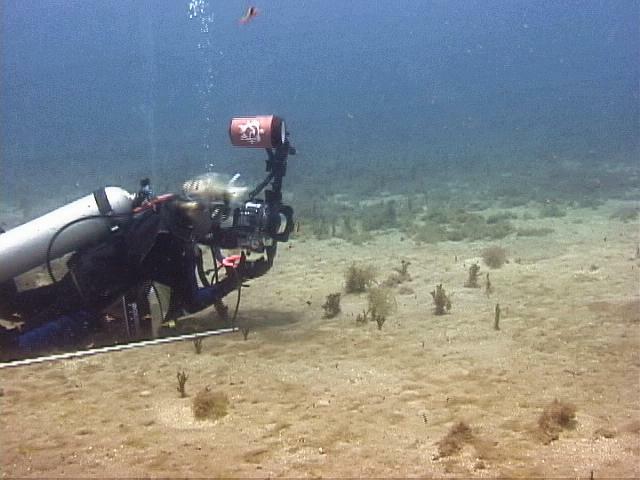 2003 Lyngbya samples from our dive site will be analyzed by University of Queensland student, Karen Arthur. She'll be investigating levels of toxin in the Lyngbya that blights our area. We eagerly (but patiently) await the results of her study. As already mentioned, 2003 was an off-reproductive year for our females. We were treated to their presence on the reefs here, but their needs for quiet and privacy also demanded we observe even more proactive courtesy than we'd normally summon. Turtles need quiet and privacy too. Essentially we had only one "Homeby" missing: Tiamat, a sweet charmer who we've known since she was a honu adolescent back in 1991. George Balazs reported her nesting at East Island this June. As we write this, we know Ti should be very close to home if her passage has gone safely so far. We hope to still be here in the water when she completes her return swim. So during our final week here, we wait for Ti. What can we say? Zeus. Our Numero Uno male still hasn't shown himself. He's been at Honokowai since 1992 and it looks like 2003 will be our first NO-ZEUS summer. So during our final week here, we wait for Ti and hope for Zeus! End of August. Our diving days can now be counted on the fingers of one hand. We have five remaining. With any luck that might mean 6 to 8 more dives. How lucky we are to have come to know these animals. How privileged. For that matter, how lucky and privileged we are to know George Balazs to the extent we do. How they enrich our lives--and the Learning That Happens! 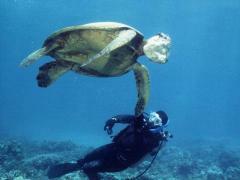 George Balazs and honu friend: instructors.